The only thing women love more than their shoes is their handbag. Same winning format, same obsessive style as the best-selling title Shoes. 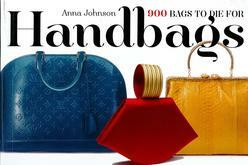 Handbags provides a visual feast of design luxury, elegance and witty novelty through over 900 full colour photographs and illustrations, and lively text. Anna Johnson, author of Three Black Skirts brings her charm and style to chapter introductions and captions as she reveals the trade secrets of designers (in great interviews) and capture the "It" bag that defines a period of decade.